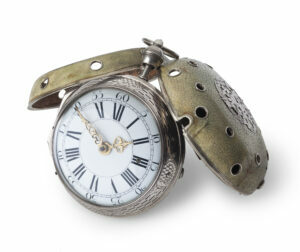 The spring-driven, 25-hour going movement of this pocket watch is constructed between two gilt-brass plates. 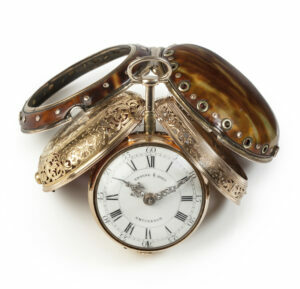 The going train has a spring barrel, chain fusee and verge escapement with balance and balance spring. 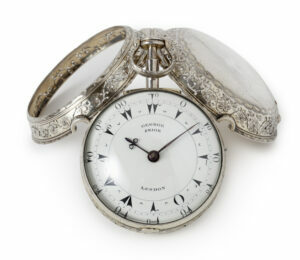 The finely pierced and engraved silver balance bridge depicts a lady in a long dress. Next to this bridge is a silvered regulation disc. 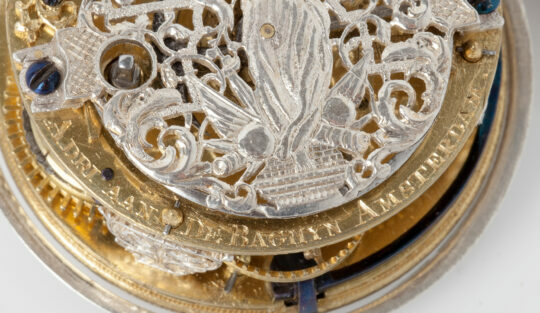 The maker has signed the watch along the edge of the backplate: ADRIAAN DE BAGHYN AMSTERDAM. The silver, champlevé dial has a semi-circular Roman chapter VI-XII-VI in the upper part, with Arabic five-minute and minute divisions all around. 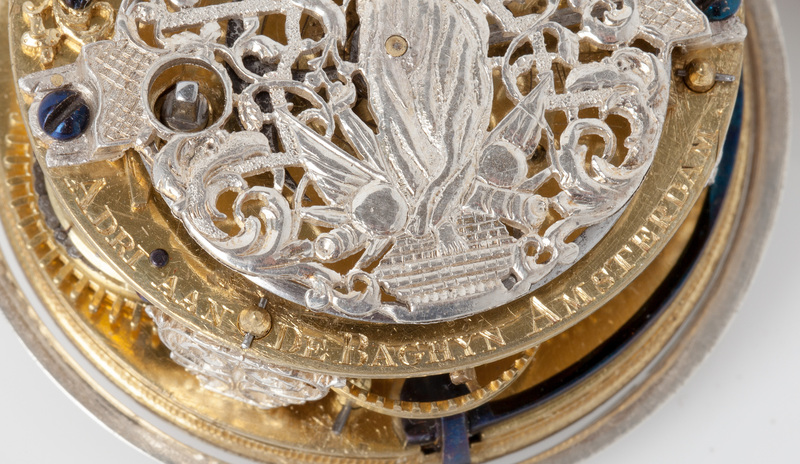 The hours are indicated by a blued steel rotating disc with pointer, for the nights with a gilded star-spangled heaven and moon, and for the day with a gilded sun motif. The minutes are indicated by a blued steel hand. Above the 30 is a date aperture. The lower half depicts a chased Chronos figure. 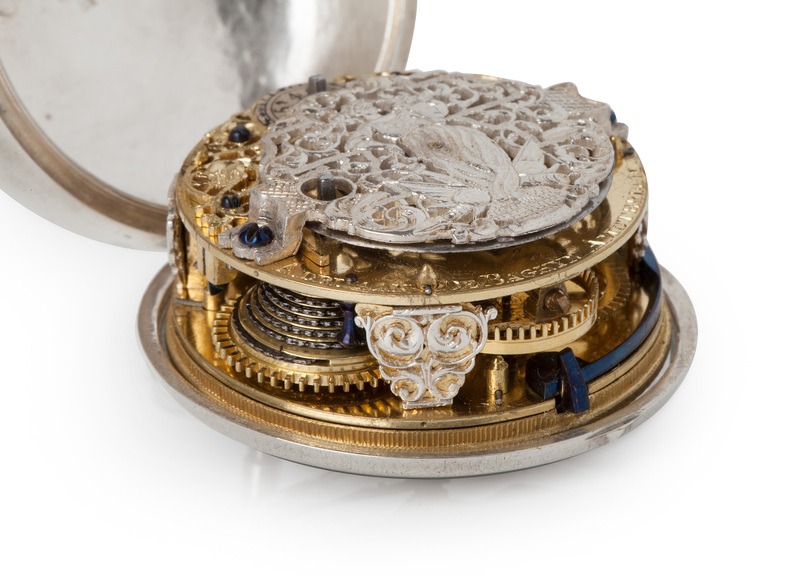 The inner silver case, which is smooth and contains the movement, has a convex glass in a silver bezel, which can be opened with a catch at the bottom. Upon opening another catch is revealed with which the case can be unlocked and turned outwards. At the top is a pendant with suspension ring. 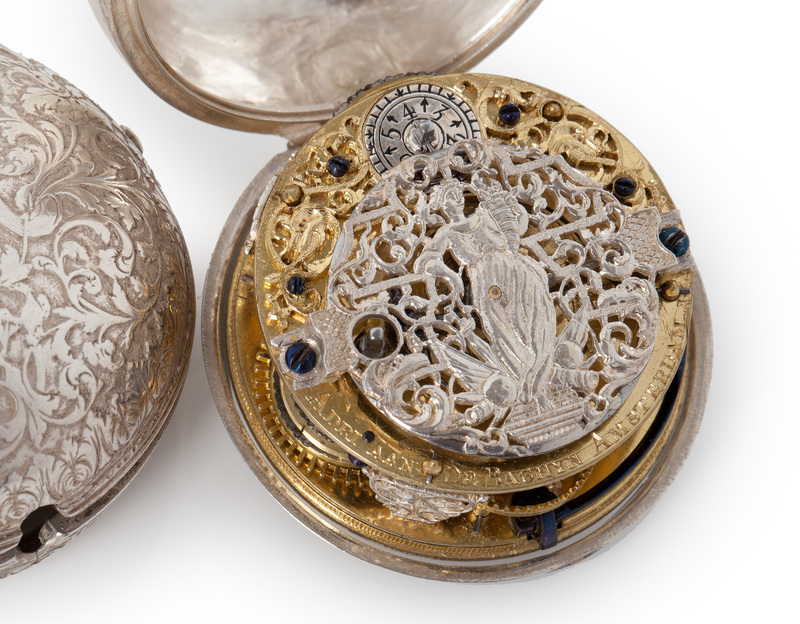 The silver outer case is chased with scroll and leaf motifs. The back depicts fantasy animals. Enrico Morpurgo, Nederlandse Klokken- en Horlogemakers vanaf 1300, Amsterdam, 1970, p. 5. 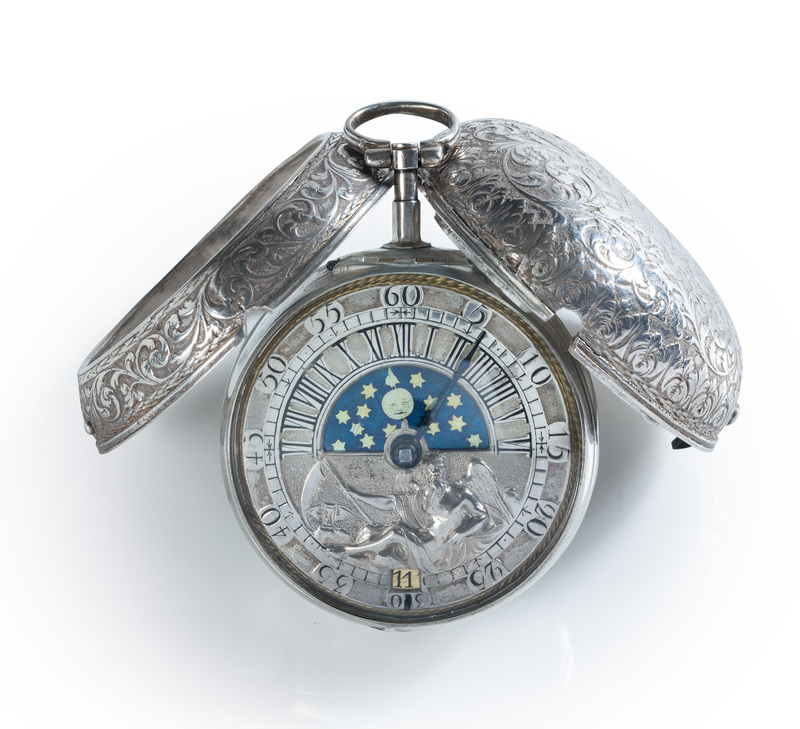 Adriaan van de Baghijn was active as a clock and watchmaker in Amsterdam van c. 1710 until c. 1750. He was a famous maker who had his workshop on the Haarlemmerdijk. There are several clocks and watches by his hand known.